Businesses can face significant red tape when operating in multiple Canadian jurisdictions, including duplicative reporting and registration fees. A new multi-jurisdictional registry access system (MRAS) is being developed that will enable streamlined registration and mutual recognition for multi-jurisdictional businesses. The system is expected to be in operation by 2020. 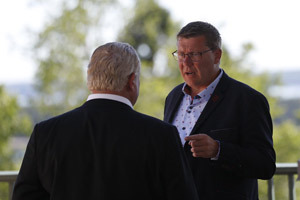 Premiers emphasized the importance of maintaining momentum and completing this work as soon as possible, and directed responsible ministers to continue to explore ways to ease the administrative burdens associated with business registration and reporting requirements. Additionally, Premiers have committed to addressing registration red tape for businesses who manufacture pressure equipment such as boilers. Provinces and territories are in the process of enabling mutual recognition of Canadian Registration Numbers (CRN) for pressure equipment, removing redundant and expensive reviews by individual jurisdictions. 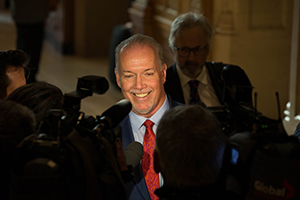 Premiers remain committed to leading ongoing, focused work towards breaking down remaining barriers to internal trade. 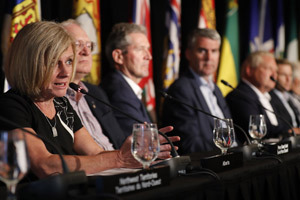 In advance of the upcoming First Ministers’ Meeting on the economy, Premiers called on the Prime Minister to ensure that the federal government addresses trade barriers in its areas of jurisdiction, including reducing the high number of federal procurement exceptions in the Canadian Free Trade Agreement (CFTA), and working with provinces and territories on collaborative implementation of initiatives in areas such as meat and food inspection, and energy efficiency standards. Premiers emphasized that enhancing trade within Canada goes beyond eliminating regulatory barriers. 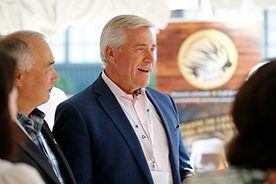 Premiers agree on the necessity of moving Canada’s resources to market in timely, predictable, fair and sustainable ways that Canadians trust through strategic infrastructure including roads, railways, bridges, ports, tunnels, pipelines, transmission lines and airports to help grow our economy. The federal government also has a responsibility to work closely with provinces and territories to ensure Canada is viewed as a safe and reliable place to conduct business. Premiers noted that the CFTA includes a commitment to ongoing ambition and enhanced trade. Discussions are underway in a number of key areas, including financial services, cannabis for non-medical purposes, and review of party-specific exemptions. 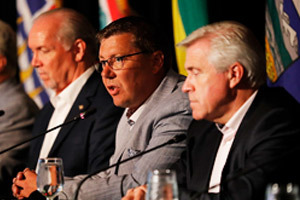 Premiers also underscored the importance of strengthening and increasing trade relationships within Canada by promoting the CFTA, developing integrated Canadian supply chains, supporting Yukon, Northwest Territories and Nunavut in their ability to participate in the food sector, and encouraging Canadian businesses to work together to ensure manufacturers are more aware of Canadian suppliers.